Radiofrequency ablation (RFA) is an established treatment modality for patients with high-grade dysplasia in the setting of Barrett’s esophagus (BE). However, this treatment is not well established for use in patients with BE and intramucosal cancer (IMC). We present our initial outcomes in a series of patients treated with RFA in the setting of esophageal IMC. A retrospective review of a prospective database was performed to identify and review patients undergoing RFA for biopsy proven IMC. In each case, radiofrequency ablation was performed using the HALO system (BARRX Medical, Sunnyvale, CA). Visible lesions were removed by endoscopic mucosal resection (EMR) prior to ablation. Main outcome measures included patient demographics, characteristics of the BE, ablation technique and variables, procedure complications, and treatment outcomes. Patients achieving complete response (no dysplasia or BE) had intensive biopsies performed every 3 months for continued surveillance. Between February 2006 and August 2010, 11 patients were treated with RFA. The worst pathologic grade of BE prior to RFA was IMC with high-grade dysplasia in 100% of patients. The median age at first treatment was 72 (range 35-84), and 9 (82%) patients were males. The median length of BE was 4 cm (range, 1-12 cm). Ten (91%) patients underwent an (EMR) for visible nodularity preceding treatment with RFA. All patients underwent RFA using the HALO system as follows: the HALO360 circumferential balloon catheter was used alone in 1 (9%) patient, the HALO90 focal ablation device was used in 5 (45%) patients, or a combination of both was used in 5 (45%) patients. Five patients were in the early stages of ongoing RFA treatment regimens and did not have sufficient follow up data. Of the remaining patients, 5 (83%) achieved complete eradication of IMC, dysplasia and BE after undergoing an average of 2.2 RFA sessions (range 1-3). During a median follow up of 19 months (range 3-26 months), no histological recurrence of dysplasia or BE was seen. One patient, with a family history of esophageal cancer, underwent an esophagectomy after 3 RFA attempts failed to eradicate persistent non-nodular IMC; he remains cancer free on continued surveillance. There were 2 procedure related complications: one patient had post procedure nausea requiring overnight admission; one patient experienced dysphagia to solid food, which resolved following a single endoscopic dilation. 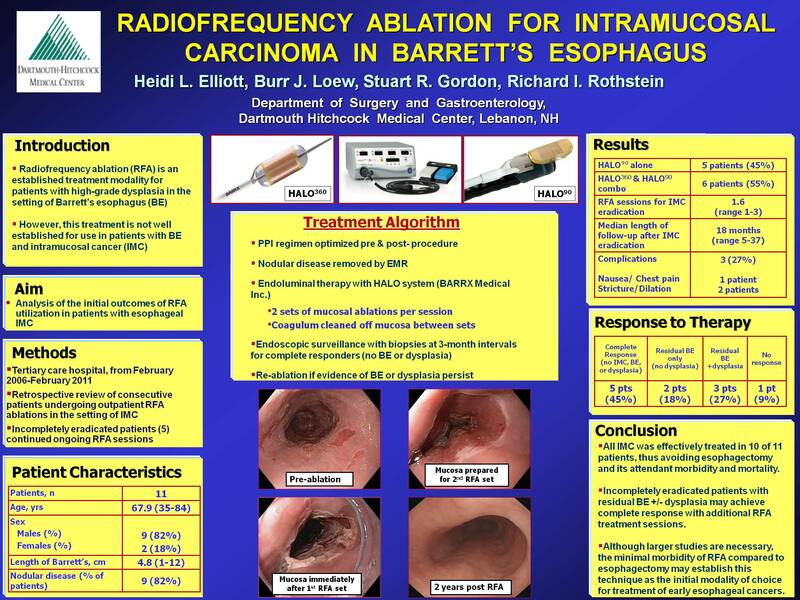 Radiofrequency ablation is becoming a widely accepted treatment modality for patients with Barrett’s esophagus and early neoplasia. Adding our experience to the current literature, this report demonstrates the feasibility and efficacy of RFA for patients with IMC. Thus far, 5 of 6 patients (83%) treated with RFA experienced complete remission of IMC, dysplasia, and BE without being subjected to the morbidity of esophagectomy. We submit that RFA offers a safe, effective outpatient treatment alternative for the challenge of managing BE containing IMC. Although larger studies are necessary, the minimal morbidity of radiofrequency ablation compared to esophagectomy, may establish this technique as the the initial modality of choice for treatment of early esophageal cancers.